Print documents with laser-quality black text. 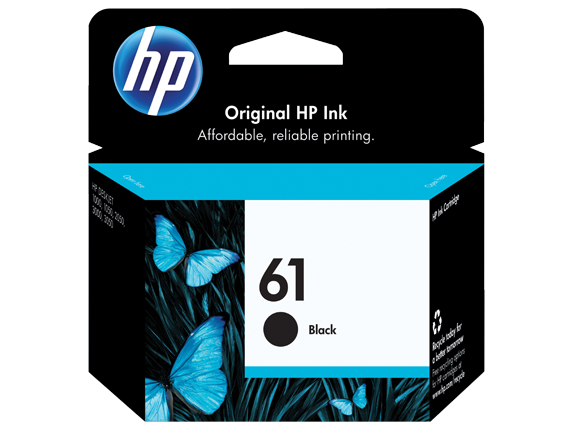 This Original HP ink cartridge is designed to deliver user-friendly features and a great value.HP 61 Black Ink Cartridge. Archived laser-quality documents retain black text and image quality for decades without fading. Enhance the quality of your documents, using papers with the ColorLok logo. Count on reliable performance and high-quality results in challenging environmental conditions. Easily monitor cartridge ink levels using the convenient on-screen ink gauge. Your documents will look exceptionally sharp and vibrant—and they’ll remain that way for decades to come with no fading.1 It’s yet another reason to make sure you use the ink that works best with HP printers: Original HP ink.